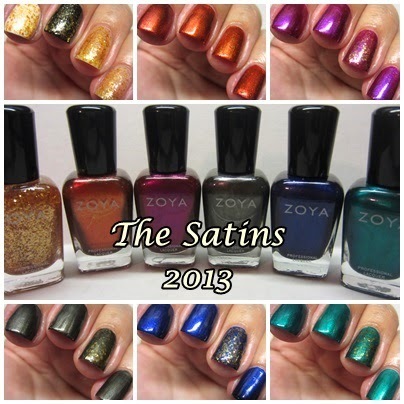 I have an all new Fall 2013 collection from Zoya to show you today. A gold flakie topcoat. One coat over white. Once coat over black. Two coats alone. A rusty orange/red. Two coats. No topcoat. Maria Luisa on the ring finger. A glittery dark fuschia. Two coats. No topcoat. Maria Luisa on the ring finger. A smoky black/brown. Two coats. No topcoat. Maria Luisa on the ring finger. A glittery royal blue. Two coats. No topcoat. Maria Luisa on the ring finger. A glittery turquoise. No topcoat. Maria Luisa on the ring finger. This is a lovely fall collection!!! The formula is perfection and the coverage is amazing. I would call the whole collection one coaters, but for the sake of continuity I won't. I'll just say that if you're very neat and your nails are of equal length to mine, you could easily do one coat of the opaque shades. My personal faves are Maria Luisa and Neve. I had envisioned the gold flakie topcoat working over each one of the shades in this collection, and perhaps, in your opinion they do. I thought it looked better though,over a few of them, like Neve and Giovanna. *special thanks to Zoya for sending this lovely Fall pallet of colors for me to show to my readers. You did oustandiing manis with all of these! Thank you for your hard work! however, I am not 100% sure I need this collection. kind of... seen them all before. Or is it just me getting old? In any case, I really like Maria Luisa, Giovanna and Channing. Thanks for the wonderful post!! Lovely colors! I think I like Channing and Mason the best!